rovence has emerged in recent years with a number of exciting high quality small domaines from most of her appellations. The change has been less dramatic than in the Midi, but here too many quality-minded individuals are bringing a new focus to viticulture and expressing the potential of their terroirs. The role of Provence as a purveyor of easy drinking pink plonk to sun-seeking tourists is gradually changing and indeed many of the examples are much improved. Some interesting wines and fortified styles are emerging from Corsica although the wines remain hard to find outside France. In the main they continue to be traditional, the best offering real character. While rosé remains the mainstay of Provençal wine production, exciting reds and some very well made whites have emerged over the last fifteen years or so. In the foothills of the Alpes-Maritimes inland of Nice the tiny appellation of Bellet, with a total of a mere 39 ha under vine, offers some unusual albeit pricey, well-structured reds and lightly floral nutty whites and fruity rosés. The proximity of neighbouring Italy shows itself with the Braquet (Brachetto) among the varieties that make up the permitted red blend, along with Folle Noir and the more usual Grenache and Cinsault. The vineyards are planted at altitude of some 300m, moderating the climate.This provides an unusual opportunity in ripening Chardonnay in such a southerly maritime climate, which in the whites is blended with Rolle. The vast bulk of central Provence is covered by the appellations of Côtes de Provence and Côteaux Varois. While both produce vast amounts of glugging rosé, some very impressive reds are being produced from blends of Rhône varieties, some with the addition of Cabernet Sauvignon. 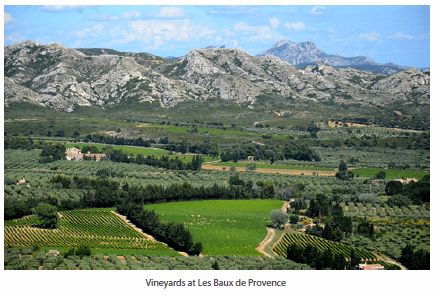 The Côteaux d’Aix en Provence and the spectacularly sited vineyards of Les Baux de Provence produce similar wines. Domaine de Trevallon, now forced to label its wine as IGP des Bouches du Rhône, set the trend with a stunning blend of Cabernet and Syrah. There are a number of other such blends now; some like Trevallon use more traditional ageing in large vats while others are seduced by new oak. Whatever the approach an exciting array of different styles is emerging. Palette is another tiny AC of just 40ha for both red and white and with only a handful of established producers, although more are emerging. An extensive number of varieties can be planted but increasingly replanting is concentrated on Syrah, Grenache and Mourvèdre. The two coastal appellations of Cassis and Bandol between Marseilles and Toulon are sources of red, white and rosé. Generally Cassis tends to be pretty dull fare but there is the odd impressive white. The best whites and rosés from Bandol are certainly very good but it is the reds that you should look out for. The appellation is situated in the foothills just inland of the port of Bandol in a natural coastal amphitheatre. The vineyards stretch from La Ciotat in the east to Sanary-sur- Mer in the west and enjoy a unique warm, dry maritime climate. The style of the wine itself varies surprisingly due to differing calcareous, gravel and clay soils and varying levels of Mourvèdre, the main grape variety. Established Bandol leaders Domaine Tempier and Château Pibarnon are now being joined by a new wave of small, high-quality growers. This is an exciting area to follow. Remember, though, that these wines need cellaring, often for up to a decade. There are three main appellations on the island of Corsica; Vin de Corse, Patrimonio and Ajaccio. Almost all viticulture is carried out around the coast. The forested, mountainous interior is far too extreme for viticulture. 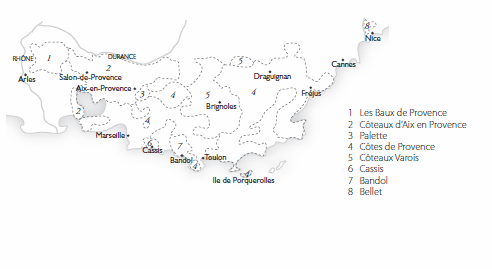 There are also a number of crus within the Vin de Corse appellation: Calvi, Sartène, Figari, Porto-Vecchio and Côteaux du Cap Corse. Both Côteaux du Cap Corse and Patrimonio are entitled to the Muscat du Cap Corse appellation and it is some of these good to very good rich fortified Muscats which offer the greatest excitement here. Some good reds are also produced from the native Nielluccio along with Grenache, Carignan and Cinsault.